Meet Callie! She is an adorable 8 year old girl. Callie was born with something called blepharoptosis. This condition affects how far the eyelids extend. It doesn’t seem to have an effect on her vision but GWCA is in the process of asking for an update on her condition to clarify. Callie is described as being talkative, energetic and quick in reaction. She is fond of playing with toys and playing games with her peers. Callie is inquisitive and frequently asks how and why questions. She seems to be slightly delayed compared to her peers but she doesn’t seem to have a language delay. If you’re interested in reviewing Callie’s file, contact GWCA today! Meet Charlotte! 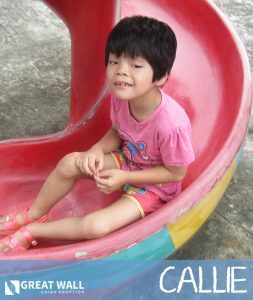 Charlotte is an adorable kiddo who will be turning three this January! She has been diagnosed with hydrocephalus and some physical and cognitive delays. Based on her file, which was prepared in April of 2015, it sounds as though she has stiff lower limbs and has some delayed mobility. She also was not responsive to being called by her caregivers at the time the file was prepared. Our staff is working hard to get more updated information from Charlotte’s orphanage regarding her need and delays! Her caregivers described her as being a smiley, happy kiddo who loves to laugh and be cuddled. 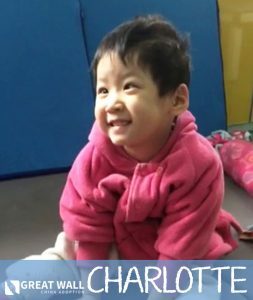 If you’d like to learn more about Charlotte, please reach out to Great Wall! Clark is a sweet boy from China that recently turned 11 years old. Clark was born deaf but he has since received a Cochlear Implant and so he has some hearing ability now. Since he received his Cochlear Implant 4 years ago, has attended a special boarding school to help him learn language and speech. Clark has great self-care skills and he is a very easy person to live with. He has an easy-going personality and gets along well with others. He likes to draw and make models with his hands. Clark is good at math and he likes to play basketball with other children at school. 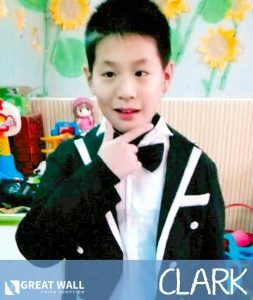 You can contact the China Home Finding Team at Great Wall if you would like to learn more about adopting Clark. We hope we are able to find Clark his Forever Family soon! Meet Sylvie! She is an adorable little girl who is 4 years old. Slyvie was born with cerebral palsy. She has a little more difficulty using her gross motor skills than she does using her fine motor skills. She can stand and walk with some support but she can grasp small objects with her thumb and index finger deftly. Sylvie is described as being curious about her surroundings and interested in what others are saying. She has high muscular tension which we believe she is receiving therapy for. 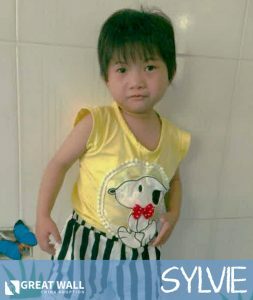 Great Wall is in the process of requesting an update on Sylvie but contact one of our matching specialists today if you’d like to review her medical file!